No actor goes from zero to ballistically berzerk quicker than Michael Shannon. Whether it's Revolutionary Road or the upcoming Man of Steel, you can bet the ranch, dude will go batshit bonkers at some point before the credits roll. The once character actor-turned-legit star has an abundance of opportunities to flash that hair-triggered-psycho skill in The Iceman, a disjointed, surface-level look at a man who racked up a bigger body count than Michael Myers and Leatherface combined. Shannon is Richard Kuklinski, a real-life, Jersey-based hitman responsible for some 100-plus kills over the course of three decades. While initially simply killing for the hell of it (slashing a guy's throat for bad mouthing his lady), Kuklinski finds the physical carnage financially viable after coming across underworld kingpin Roy DeMeo (Ray Liotta doing a version of the same character he's done for the past twenty-plus years). 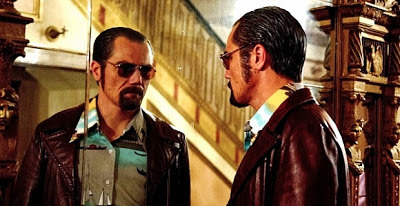 What follows is a procedural treatment of Kuklinski balancing his mafioso work for the DeMeo clan with Kuklinski's domiciliary life with wife (the ageless Winona Ryder) and adorable daughters. Director/co-writer Ariel Vromen stitches chunks of The Iceman's tale together as if pressing non-interlocking puzzle pieces together with little regard for flow. This is where Vromen's lack of experience working on projects of any significant scale is on full display. Lucky for Vromen, he has a premium cast in front of his lens to elevate the proceedings. Shannon, Liotta, Ryder, James Franco, Stephen Dorff, Robert Davi, Chris Evans – yes, even a goofily-mustached David Schwimmer – capture interest, as the story haphazardly scatters about. But make no mistake, much like 2011's Take Shelter, this is a Michael Shannon showcase. Scoring big again as an unconventional leading man, Shannon proves once more to be an irresistibly-compelling presence. Getting to see Shannon boogie to Blondie is enough to warrant a stay of execution.